On April 26th six collegiate startup teams battled it out on stage in front of a panel of judges and a record-breaking audience of 170+ people at THE CLIMB | Pitch Night. Hosted annually by the Jake Jabs Center for Entrepreneurship, THE CLIMB is a business development challenge open to all Colorado universities. This year’s competition marked 17 years of empowering student entrepreneurs to blaze their own trail. From mobile apps to upcycled shipping containers to subscription boxes of whiskey, several industries were represented at this year’s competition. Toti Cadavid, founder and CEO of U-Fulfilled; Heidi Ganahl, founder of Camp Bow Wow and CU Denver Regent; Joel Appel, owner and CEO of Launchpad, LLC; and Jake Jabs, president and CEO of American Furniture Warehouse and Jake Jabs Center namesake, served on the judging panel. CBS4 Denver Meterologist Lauren Whitney served as emcee for the evening. 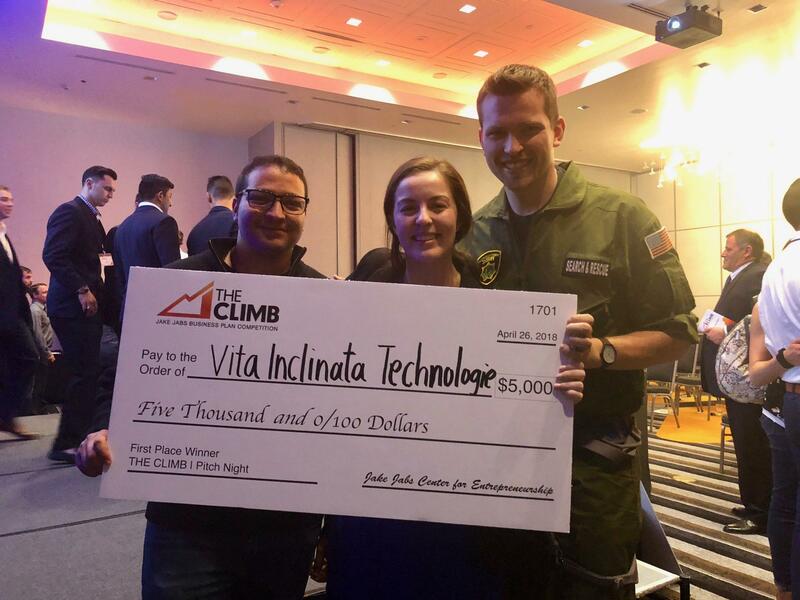 Vita Inclinata Technologies – a conglomerate team made up of students from CU Denver, University of Colorado Boulder, Colorado School of Mines and even the University of Maryland – won first place ($5,000). A small aerospace company, Vita is developing critical technology to mitigate cable swinging during sling load and rescue helicopter operations. After a helicopter search and rescue mission failed to rescue CEO Caleb Carr’s friend dying of a heart attack in the Oregon wilderness, the idea for Vita was born. Leveraging Vita’s technologies, helicopter operations can be 2500 percent more effective, saving thousands of lives a year. “Winning THE CLIMB is the catalyst to making Vita successful, and ultimately save lives in two years,” said Carr. “By winning tonight, it’s bringing us that much closer to the next DARPA grant or angel raise, which is exactly where we need to be to bring our product to life.”…… See Full Article at Here! Previous Post Vita is pitching again! Next Post Come Visit Us at AirVenture!